Heather is using Smore newsletters to spread the word online. People who are blind tend to have differences in the brain than those who are not visually impaired. Blindness has been shown to cause structural changes in the brain, which is believed to be the brains way of adapting to the loss of vision (University of California, 2009). Visual regions of the brain have been found to be smaller in volume in individuals who are blind than in individuals who are not (University of California, 2009). Non-visual areas of the brain tend to be larger in those who are blind than in those who are not (University of California, 2009). In those who are blind the visual cortex can change its function. Research has shown that in individuals who are blind the visual cortex can dramatically change it's function andcan be use in language processing (Trafton, 2011). It appears that in individuals who are blind other areas of the brain and other senses work to compensate for the loss of vision. These scans show the active regions of the brain during language processing. The scans show that only in those who are blind is the left visual cortex active during the language processing tasks (Trafton, 2011). Some research suggests that in those who are blind the modules in the visual cortex that are used in spatial location are still utilized in a different manner- processing what they hear and touch (Georgetown University Medical Center, 2010). In the brains of those who are blind the touch and sound are also processed in the visual cortex as well as the other parts of the brain that are devoted to those senses, thus making these sensory abilities stronger and compensating for the vision impairment (Georgetown University Medical Center, 2010). Studies have also shown that when a blind person reads braille through touch the visual cortex is also activated (National Institute for Physiological Sciences, ND). The above scans show the brain activity of a sighted person versus a blind person during the reading or braille (National Institute for Physiological Sciences, ND). 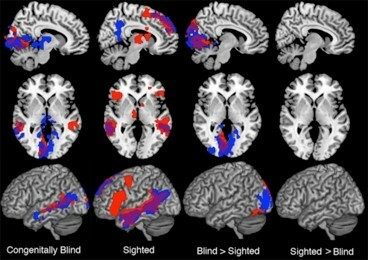 In people born blind, brain regions that usually process vision can tackle language.